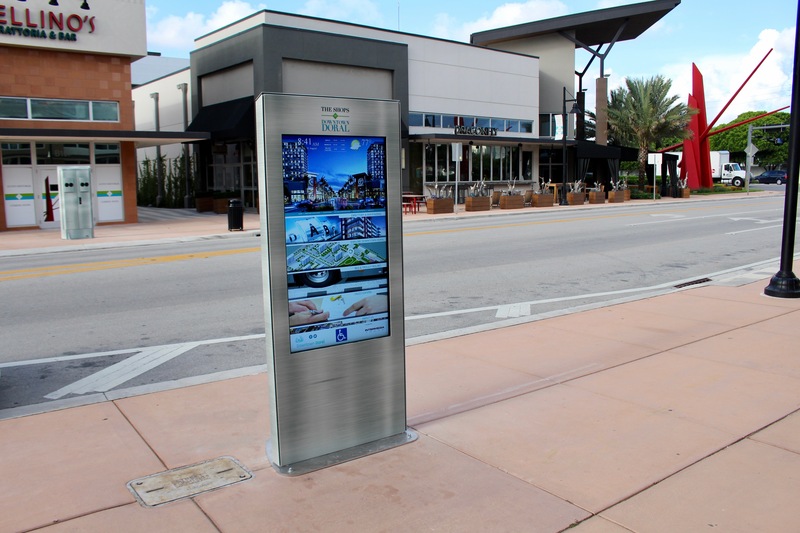 Intermedia Touch helped Downtown Doral deliver an enhanced visitor experience by creating and installing a set of custom outdoor, interactive kiosks to assist their guests at The Shops at Downtown Doral navigate the community. The 6.6” feet tall kiosks feature 55″ inch interactive screens that have an intuitive, built-to-suit application programmed with the user in mind. Wrapped in a brushed steel cover, the outdoor kiosks provide guests with detailed wayfinding; a directory with all the points of interest; retail locations and restaurants in the Downtown Doral area. The custom application also provides the convenience of the City of Doral trolley routes. The application’s intuitive content management system allows the Downtown Doral property management team to quickly and seamlessly update content. Intermedia Touch’s outdoor kiosks are built to withstand the weather elements by being rated IP 65, meaning that they are completely sealed to prevent moisture and other particles from entering and damaging the unit. The outdoor kiosks also come with a built-in heating and cooling system to prevent overheating, as well as an amplified weatherproof sound system and a 55” inch touchscreen display with an anti-glare and anti-vandal proof glass. To learn more about Intermedia Touch’s offerings and similar products, visit www.intermediatouch.com or call 305-517-3894. To see the kiosks in person, stop by The Shops at Downtown Doral located in Miami off of 87th Avenue and NW 53rd Street steps from Downtown Doral Park and Doral Government Center.